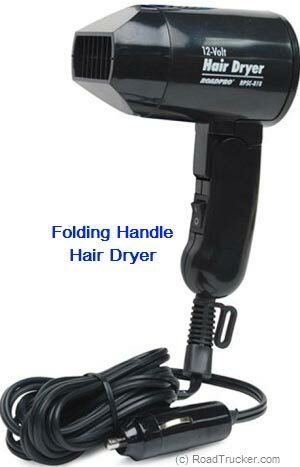 The RoadPro 12 Volt Hair Dryer is an ideal item for your mobile lifestyle. Blows gently, not hard; warm and not hot. If you go camping frequently, this 12-volt hair dryer is for you. Folding handle with hang loop is for easy storage in your truck or car. Feeling cold out on a road trip? The RoadPro RPSC-818 can be used to help warms up your hands and feet quicker. Ice on the windows? Try using RoadPro's Hair Dryer to help defrost your window on those cold and snowy mornings or clear up the dew that settles on objects. Another great innovation from RoadPro, your trusted travel companion, providing everything you need for on-the-go living.